As is well known by tenant activists, the State Senate has long been the realm where any tenant-friendly legislation, from MCI limitations to elimination of preferential rents, has gone to die. While it did seem likely that the Democrats would be controlling the Senate after Election Day, following a decision by rogue Democrat group, the Independent Democratic Coalition, to end an alliance with Republicans, the Republicans then managed to win a narrow, but still clear majority, making an alliance with the IDC unnecessary. Some critics have been quick to put the blame on the Election Day results on nation-wide voting trends as well as low turnout during a non-presidential election year. Others have said the blame is Governor Cuomo’s for not making an effort to help the Democrat candidates. Mike McKee, treasurer of Tenants Political Action Committee, is in the latter camp, saying he believes Cuomo would rather have Republicans running the Senate. As for what all of this will mean for tenants with the rent regulation laws up for renewal or expiration next year, McKee said while the real estate industry clearly has the edge with a Republican-controlled Senate, tenants may still have a shot at getting some meaningful reform. That is, if they’re willing to fight for it. McKee made a point to note that he personally abhors the 421-a tax abatement since it subsidizes “billionaires buying condos.” But developers want it as well as J-51, with McKee saying they hadn’t been scared off by “Roberts v. Tishman Speyer,” which ruled that owners accepting those breaks couldn’t deregulate apartments in those properties. “Those programs are extremely lucrative,” he said. And, said McKee, tenants should keep their eyes on the prize, which is vacancy deregulation. “We mean full repeal. Not simply raising the threshold like they did three years ago. They raised the threshold and called it a great victory and they’re still trying to spin it as a victory when it was a cosmetic change.” This was in reference to the amendment of the law that allowed landlords to de-regulate an apartment if the rent was $2,000 and the tenant’s income was $175,000 for two years, by increasing that amount to $2,500 or more and $200,000. 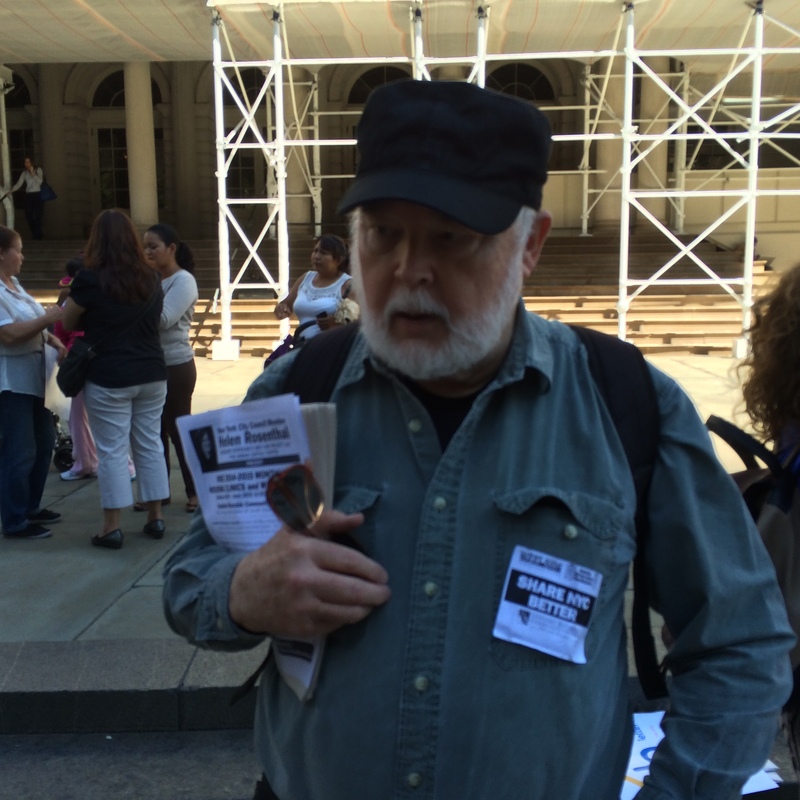 “We have rent stabilized apartments in Stuyvesant Town renting for $5,000 or more because politicians allowed the rent laws to be trampled,” McKee added. What tenants can do, he said, is ask their Assembly members to put pressure on Speaker Sheldon Silver to get tenant-friendly legislation to become more than just one-house bills. What doesn’t need to be fought for, said McKee, is repeal of the Urstadt Law, which would return home rule on housing to the city. Focusing on that this year, he believes is a trap, since the odds of the Senate agreeing to to it are too slim. McKee believes that close to 400,000 units of affordable housing have been lost in the past 20 years due to erosion of the rent laws. In 1996, 56 percent of rental units in the city were rent controlled or rent stabilized, based on figures from a city housing and vacancy survey that’s done every three years. Fifteen years later, in 2011, that number had been whittled down to 47 percent, based on the same source. “That should tell you something about the rate of loss,” he said. In some cases, this is due to condo or co-op conversion, but the majority of those cases are vacancy deregulation. And as always, said McKee, tenants should also keep their mouths open — not to mention their wallets —in the effort to help TenantsPAC. “I’m talking about money, I’m talking about bodies,” he said. “We have all volunteers so 95 percent of all we raise goes directly to the candidates we support.” (The other 5 percent goes to the organization’s phone, internet, and office rent expenses.) The money, however, never comes close to what the real estate industry spends to elect Republicans. (As of October 20, the Real Estate Board of New York had spent $1.9 million and owner group the Rent Stabilization Association spent $500,000.) Additionally, unlike REBNY, the RSA did this quietly, funneling the funds to a Washington, D.C.-based Republican State Leadership Committee which then gave an even larger amount to a New York group which spent heavily to elect Republicans, Crain’s reported on Friday. He noted that many volunteers as well as donors have been residents of Stuyvesant Town and Peter Cooper Village. But for those whose rent demands don’t allow for large donations or work schedules don’t leave time for trips upstate to go door-knocking, McKee recommends phone banking as a good alternative for would-be volunteers. This can be done at home, usually in the evenings, and even after elections, since TenantsPAC phone banks in support of legislation. As for why Election Day was such a dismal one for Democrat legislators and candidates, McKee believes Democrat voter apathy is partially to blame. While he was in upstate Kingston going door to door to campaign for Democrat Senator CeCe Tkaczyk, who ended up losing, he saw it firsthand. “In non-presidential election years, Republican voters show up and Democrats tend to stay home,” he said.